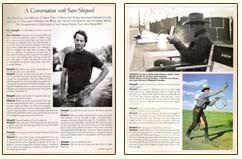 The award-winning actor-playwright has been called "The Elusive Cowboy of the American Theatre" and "Gary Cooper in Denim." 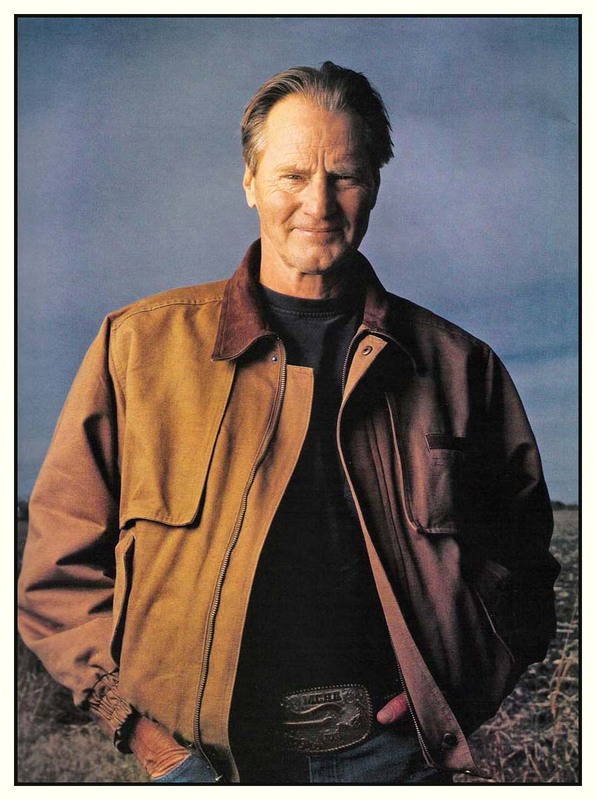 Sam Shepard's career continues to thrive with new western roles opposite Salma Hayek, Penelope Cruz, and Brad Pitt. Fairly early in THE RIGHT STUFF, director Philip Kaufman's rousing ode to risk takers and history makers, there's a classic movie moment that ingeniously commingles simplicity and symbolism, Western mythos and Space Age innovation. A cow boyish figure - lean, laconic, and leather-jacketed - appears on horseback in the high desert of California. He boldly guides his steed through the spindly brush to approach a clearing where an X-1 aircraft lies still but not silent, randomly belching flames like some dread creature of dark fantasy. The horse, nor surprisingly, is spooked by the strange new vehicle. But the cowboy is calm, his expression quizzical. He appears to be a man who knows he is looking at the future. Strictly speaking, this scene isn't our first glimpse of Sam Shepard as legendary test pilot Chuck Yeager in Kaufman's 1983 extravaganza. (He initially appears a few minutes beforehand, at the graveside service for a fallen comrade.) And the movie itself, faithfully adapted from Tom Wolfe's nonfiction bestseller about high-flying heroes, really wasn't the lanky actor-playwright's big-screen debut. (He had previously co-starred, to attention-grabbing effect, in Terrence Malick's 1978 Days of Heaven.) But it's this particular moment in this particular movie that sealed the deal for Shepard, that crystallized his movie-mythic persona. Since then, he has remained for many moviegoers the modern-day equivalent of an archetypal Western hero. 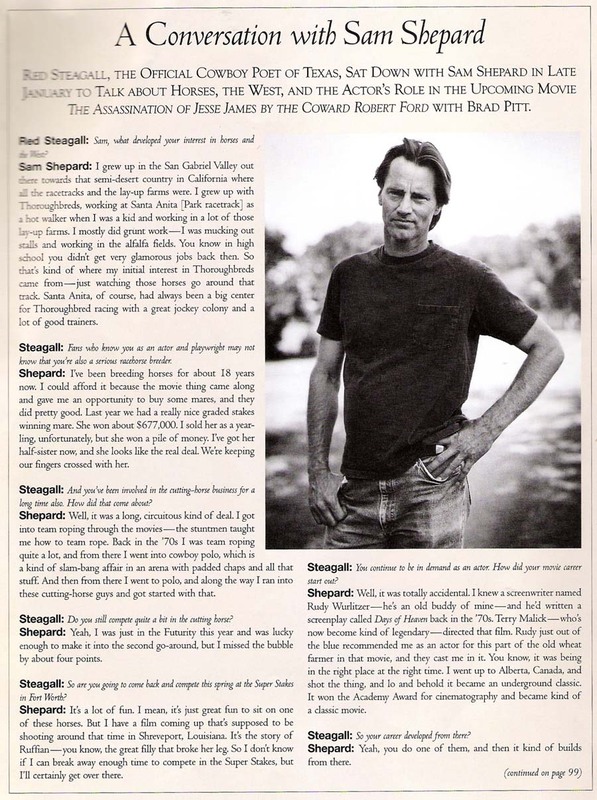 Whether he is playing a frontier lawman who needs a shot at redemption in PURGATORY (1999), a former Texas Ranger who reluctantly joins a manhunt in STREETS OF LAREDO (1995), or, most recently, a burnt-out Western movie star who wants to repair frayed family ties in Wim Wenders' DON'T COME KNOCKING, Shepard effortlessly conveys the authority and authenticity that audiences traditionally associate with the strong-and-silent icons who gallop through our collective pop culture consciousness. 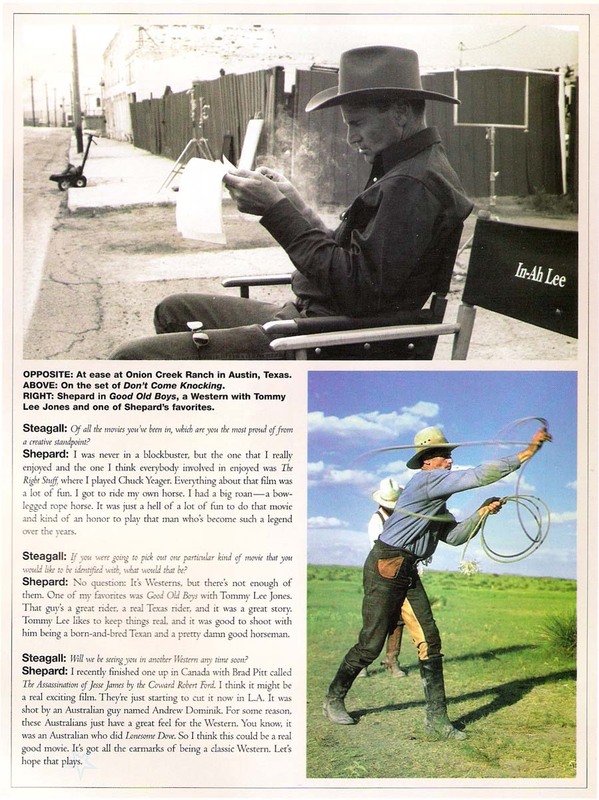 "As an actor," said essayist John Hughes, "Shepard has been America's primary heart-throb alternate-cowboy for many years. He's Gary Cooper in denim." The secret of his success? Well, it certainly helps if you look the part of a larger-than-life Westerner. And it's even better if you've actually spent some time doing the down-to-earth dirty work. 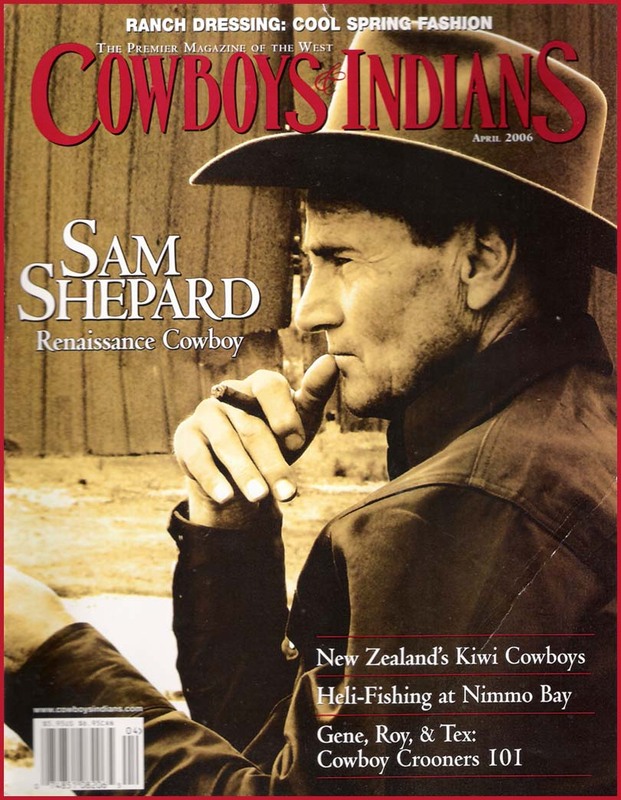 An Army brat, Shepard was born in Illinois in 1943 and spent his childhood in several cities throughout the world - everywhere from Italy to Utah, South Dakota to the Philippines - before his family finally settled on a ranch in Duarte, California, where they grew avocados and raised sheep. 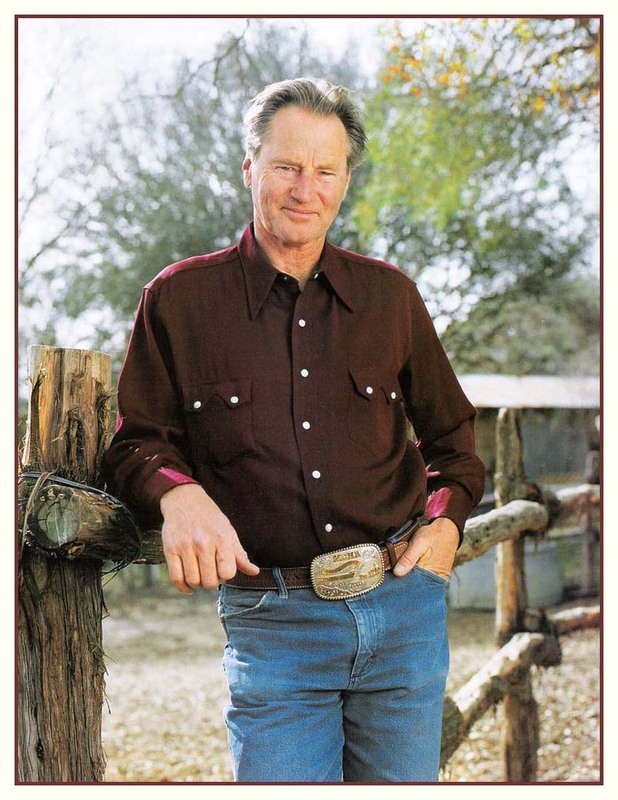 As a teenager, he developed a taste for the cowboy life, frequenting rodeos and working as a stable hand at the Conley Arabian Horse Ranch in Chino, California. He later studied animal husbandry for two semesters at Mount Antonio Junior College and seriously considered becoming a veterinarian before dropping out to join a traveling theatrical troupe. For all his big-screen appeal and success, Shepard says that he embraced movie stardom with extreme reluctance. Even after earning critical acclaim for his performances in DAYS OF HEAVEN and THE RIGHT STUFF, he feared that acting in films might compromise his reputation as a serious playwright. Shepard had earned a Pulitzer Price in 1979 for his off-Broadway drama BURIED CHILD. "There was this feeling," he says, "that my credibility as a writer would go in the toilet if I suddenly became Robert Redford. I didn't want to be a movie star. I didn't want to have that thing of being an icon. It scared the bleep out of me." Yet Shepard managed to be both movie star and serious writer, and he garnered further acclaim and honors, including 11 Obie Awards (Off Broadway theater), over the years. 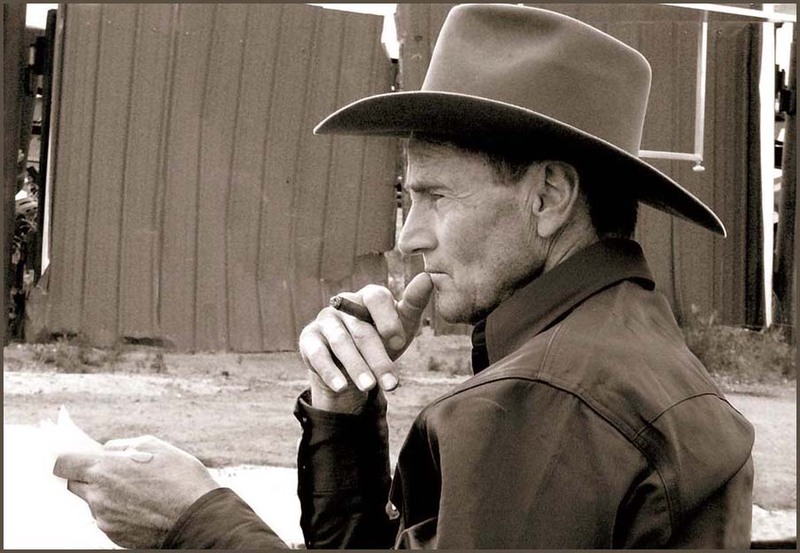 Critics responding to his more challenging plays - ranging from the sensual FOOL FOR LOVE to the volatile TRUE WEST - have branded Shepard an iconoclast, a maverick revisionist who illuminates the darker undercurrents that percolate beneath romantic renderings of the American West. A New York Times critic, for example, hailed Shepard as a "poet laureate of the West" who remains "consistently, ruthlessly true to his experience of a wilderness where America has always hidden its promise and its dream." Today, Shepard makes room for both writing and acting. For DON'T COME KNOCKING, he did both, penning the script for director Wim Wenders - his collaborator on the broodingly powerful PARIS, TEXAS (1984) - and playing a starring role. His character Howard Spence is an aging Western star who goes AWOL from his latest comeback vehicle to seek reconciliation with a former lover and the adult son (Gabriel Mann) he has never known. "It's about estrangement more than anything else," Shepard says. "It's about this American sadness that I find, the aloneness that Americans feel... I'm haunted by that American character." Other screen appearances for Shepard this year will include a supporting role opposite leading ladies Selma Hayek and Penelope Cruz in BANDIDAS, an action comedy set in 1888 Mexico, and as the legendary Frank James - opposite Brad Pitt as brother Jesse - in THE ASSASSINATION OF JESSE JAMES BY THE COWARD ROBERT FORD, the first American film by Australian director Andrew Dominik. And he continues to write for the stage: His political satire THE GOD OF HELL opened to mixed reviews in New York last November. "At the moment," however, he told British journalist John O'Mahony, "my ambition is to ride some good horses. And I would still like to keep my hand in the acting deal, as a character actor in some way, shape or form. And writing-wise - I'd like to keep all the doors open." Whatever creative route he takes, chances are good he will arrived at the same destination: the Western dreamscape that has loomed large in both his work and his life.